I recently tried out the Gurin 5-Port USB Hub! I love this product! It allows you to charge up to 5 devices all at once! This is so convenient! Between my phone, my husband’s phone, the iPads, and whatever else. Find a USB port to plug everything into isn’t always easy at our house! With this nifty little box you can plug them all in at once! We just line them all up on the deck and plug them in! It’s comparable with all devices that use a USB plug which is just about everything we need it for. It’s also small enough you can take it with you just about anywhere. I have ours set up on the desk but it would be super easy to pack it up and take it along on family trips as well. I don’t know about you but it seems like plug ins are in short supply in hotel rooms so this would be perfect! SmartLiz Technology: Detects your device to deliver its fastest possible charge speed up to 2.4 amps per port. Family-Sized: Five high powered ports lets you charge any combination of phones, tablets or other USB-charged devices simultaneously. Guaranteed Safety: UL certified design, industry grade materials and premium circuitry ensure superior performance and reliability. 100-240 volt input ideal for international travel. You Get: Liztek 40W 5-Port USB Desktop Charger, detachable power cord, user’s manual, plus our no-hassle 18-month warranty and friendly customer service. As someone who has always struggled with their weight, a scale is not always my best friend. However, as I venture into my healthy living changes I find it a necessity to chart my progress. This scaled from Gurin is great. It has a LED display that is really well lit and easy to ready. You can step on the scale and get an instant reading unlike other scales where you have to step on, step off wait for it to be ready and then step back on again. It has no slip strips so that it doesn’t move around or scratch your floor at all. It weighs up to 400 pounds accurately. It also has a free body tape measure included! Another great way to keep yourself on track and measure your progress. Extra thick and sturdy tempered glass top (the thickest in the current market) for safety and large 12″ x 13″ platform. 100% Gurin Satisfaction Guarantee and 2-year Gurin warranty. Make sure to check out their Facebook & Webpage too! I love to cook so I am always excited to try out new kitchen tools. I am also currently dieting so weighing and measuring food has become a large part of my life these days. 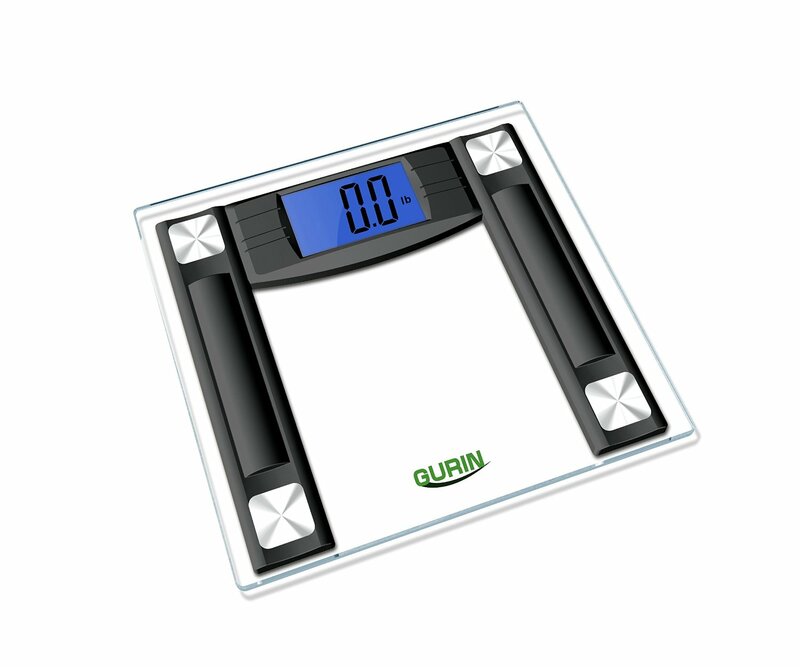 this Gurin digital kitchen scale is not only a great scale it very stylish. I love the clean sleek look with the black surface and blue LCD display. This scale is great. You can switch modes to measure solids and liquids. You can measure in pounds and ounces as well as grams. It’s really accurate in it’s readings and very sensitive with the four sensors in the surface. It’s a must have for anyone who cooks or has a need to weigh foods. 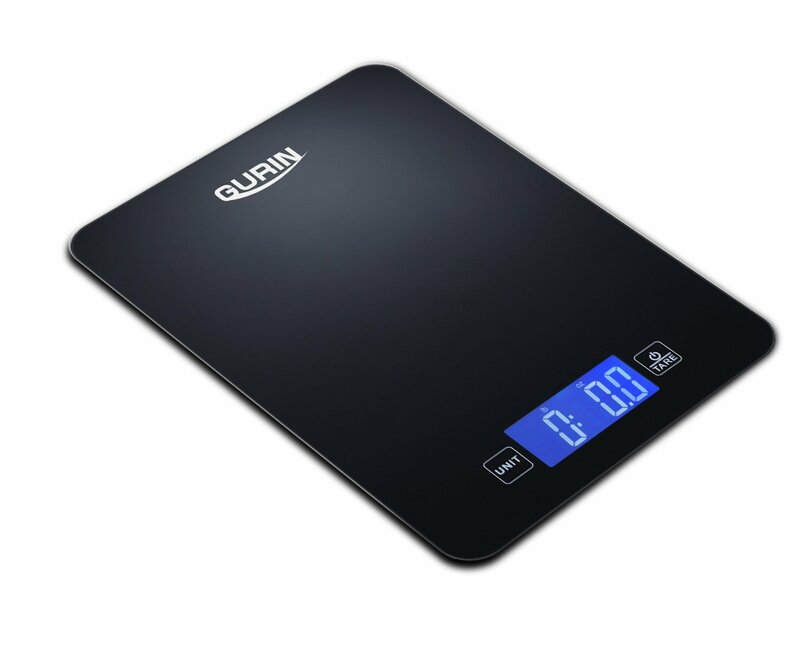 Equipped with 4 new high precision GFX sensors, the Gurin Touch Digital Kitchen Scale provides accurate measurements from 0.05 oz to 12 lbs 10.8 oz (1 gram to 5750 grams). You can purchase this scale on Amazon!